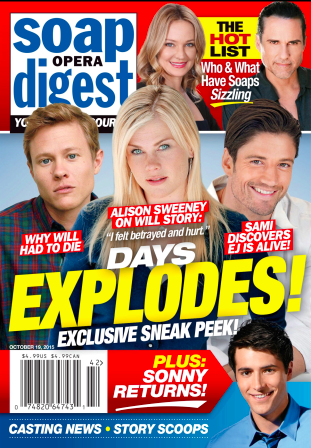 Uber-fan fave, Alison Sweeney (ex-Sami Brady, “Days of Our Lives”) hinted she’d be willing to come back to the NBC soap. What would have to happen for Sweeney to return to Salem, either for a brief visit or a longer stay? “They’d have to start by asking me, ” a smiling Sweeney told Soap Hub. She added that she’s busy with other projects right now. But that doesn’t mean she’ll always be. This Salem heroine has left and come back before, so odds are she’d make returning a priority if the opportunity arose. Sweeney expressed dismay, even anger, when the show decided to kill her on-screen son Will. “I felt hurt and betrayed,” she last year told Soap Opera Digest in an interview published in its print edition. With the tenure of head-writing team Dena Higley and Ryan Quan have come lots of welcome changes over at NBC’s sole remaining soap. This includes the return of some beloved characters from the past. Some of these even hail from Ali Sweeney’s heyday on Days, such as Austin Peck (Austin Reed) and Christie Clark (Carrie Reed). What started out as one movie called, “Murder, She Baked: a Chocolate Chip Cookie Murder,” in 2015, has now become a Hallmark channel franchise. Three more “Murder, She Baked,” following the first, through 2016. Her costar in all of them was “All My Children” alum Cameron Mathison. The two are teaming up again for a fifth one.